Looking to Make a Spectacular Faces of Transportation Entry? Looking to get those FACES we keep talking about in your photos of transportation? Take some advice from our friends over at Phoblographer – and you won’t go wrong! K9 Daily going for a ride at the Fairbanks International Airport. K9 Daisy and her handler, Officer Beverly Moore, work as a nartcotics detection team for the state of Alaska Department of Transportation at the Fairbanks Airport Police and Fire Department. One of may boaters riding the rare Alaskan sun on July 25, 2012 in Ketchikan. Alaska DOT&PF Fairbanks Fire Pit Crew work to put out a fire. Alaska DOT&PF employee Bill Koitesch surveying at Chikaloon. Alaska DOT&PF employee Steven Bonse inspecting leaks along the highway. Alaska DOT&PF employee Mike Higgs observes along flood damaged highway. Alaska DOT&PF crew works to repair guardrail along the Seward Highway. Alaska DOT&PF Fairbanks Fire crew work to put out car fire. Troy Poort of Manhattan Road and Bridge hangs steel beams for the Arkansas State Highway and Transportation Department at the Interstate 430/630 Interchange in Little Rock. A crew working for the Arkansas State Highway and Transportation Department puts a steel beam into place at the Interstate 430/630 Interchange in Little Rock. Troy Poort of Manhattan Road and Bridge places a steel beam for the Arkansas State Highway and Transportation Department at the Interstate 430/630 Interchange in Little Rock. Jody R. McCoy Sr., Marcelino Casillas, and Gary Lai discuss plans for the next phase of lane reconfiguration on the eastern touchdown of the San Francisco Oakland Bay Bridge, February 18, 2012 during a bridge closure. Crews shifted traffic over the long weekend, completing an important step in the new bridge’s construction. Joe Huffman, a 29 year veteran bridge painter, applies a protective coating to the shield of the suspender ropes on the San Francisco-Oakland Bay Bridge during a bridge closure President’s Day weekend 2012. Caltrans Maintenance takes every opportunity to service the bridge that has provided 75 years of reliable service. Brian Boal, Caltrans Senior Transportation Engineer, inspects wire condition and precise strand placement in the tower saddle during the strand hauling operation for the new San Francisco Oakland Bay Bridge self anchored suspension tower. Boal oversaw placement of 137 strands over a 106 day operation that began December 21, 2011. Daniel Dait, Caltrans Senior Bridge Engineer, surveys the Doyle Drive approach to the Golden Gate Bridge after the April 27, 2012 weekend closure. Crews demolished 285,000 square feet of deck and 5 million pounds of steel, and opened part of the newly built roadway in time for the Monday commute. Officials from Caltrans and FHWA pose for a photo after climbing to the top of the new signature Self Anchored Suspension tower under construction at the San Francisco Oakland Bay Bridge. CH2M Hill Earthwork Foreman James Massey has overseen the movement of 1.8 million cubic yards of dirt during his tenure as part of the Toll 49 Segment 3B project aimed at easing congestion and improving traffic flow in and around Tyler, Texas. William Rhodes smiles broadly after paving the final test section at the National Center for Asphalt Technology (NCAT) pavement test track in July 2000. Nanette Bowles manages the effort to reconstruct a section of Nebraska Avenue, NW in the District of Columbia. Loading a wind tower base section in Coleman, TX destined for Bishop Hill Wind Farm in Galva, IL. Neb Miller and Shawn Lokkem celebrate the successful installation of the Lowry Avenue Bridge keystone segment (of the northern arch). They keystone segment is 40′ long, weighs 73,000 pounds and has a cross sectional area of 47 feet by 57 feet. Illinois DOT worker, Eric Rent, taking steel thickness measurements as part of the inspection of the Florence Bridge, over the Illinois River, in Pike County, Illinois. Construction crew working on the New Mississippi River Bridge north of downtown St. Louis. MV Malaspina Chief Purser Beret Barnes shares a light-hearted moment with the captain on a layover at the Alaska Marine Highway System’s Auke Bay terminal near Juneau, Alaska. Massachussetts DOT construction inspector Alex Normandin and Assistant Resident Engineer Bob Blackmar on August 13, 2011 as one of the 93 Fast 14’s 252 Prefabricated Bridge Units is lowered into place. MassDOT used this innovative method of construction to maximize mobility while safely replacing fourteen Boston-area bridges in just ten weekends. Victor Aristaveco of Saugus Construction and Ironworkes Local 7, preparing to attach rigging to the next 93 Prefabricated Bridge Unit as part of Massachusetts DOT’s 93 Fast 14’s 252 on July 16, 2011. The dedicated efforts of the project’s 500-plus construction workers made this ambitious project a success – safe, ahead-of-schedule and on-budget. Tourists on Segways head toward the nation’s Capitol along Pennsylvania Avenue in Washington, DC. Aaron Cox improves highway safety by performing a pre-trip inspection of a MoDOT commercial motor vehicle. Safety inspections such as this help identify problems that could otherwise cause a breakdown, or worse, a crash. Welder Cruz Chavez and Carpenter Devin Harre set a beam for the new Route H/Route 63 overpass in Boone County, Mo. The new interchange improves safety, replacing an at-grade crossing. Dustin Harre performs a visual check on a beam as it is set in place. He is part of the team building a new interchange at U.S. Route 63 and Route H in Boone County, Mo. The interchange replaces a busy at-grade crossing. Lucy Smith prepares to join other members of MoDOT’s maintenance team as they clear sediment from a Route 94 culvert between Route T and Route F in St Charles County, Mo. Maintenance such as this prevents highway flooding during heavy rain. Motorcyclists travel scenic Route 63 in Boone County, Mo., enjoying a relaxing ride. Ron Sylcox, a member of MoDOT’s Wentzvile maintenance crew, is set to repair a section of Route 94 between Route T and Route F with hot mix asphalt. Travelers in St. Charles County, Mo., appreciate the resulting smooth ride. Paul Henke, MoDOT maintenance crew worker, steps up to help members of his team remove a 7,500 foot silt fence near the service road of Route 364/Page Extension in St. Charles, Mo. Rich Bearden, MoDOT electrician, installs a flashing yellow arrow signal that guides motorists through safe left turns at Route F and Westminster Avenue, in Fulton, Mo. Tracy Adams calibrates a pH meter while preparing to measure aggregate samples that might be used for backfill. The pH measurement determines how acidic or basic a sample is, which allows chemists to predict whether the aggregate would adversely affect other materials used in construction. Dean Lay, field superintendent and Roger Graves, field supervisor, review plans for a new bridge on Route 63 at Turkey Creek in Boone County, Mo. Victor Burciaga is a shotcrete nozzleman working on the construction of a fourth bore for the Caldecott Tunnel on State Route 24 in the San Francisco Bay Area. The machine he is holding sprays reinforced concrete, or “shotcrete”, on the newly excavated rock, forming the tunnel’s initial lining. Jester Childs is a mechanic for the Alameda-Contra Costa Transit District, the third-largest public bus system in California. AC Transit Bus Operator Anita Penn poses in front of the fleet of transbay commuter buses that offer free WiFi on board. Twenty-three year old N’Neka Taylor, a cement mason apprentice, is one of only a few tradeswomen working on the new Presidio Parkway project that links San Francisco to the Golden Gate Bridge. Father-son team Ricky C. Johnson Sr. (left) and Ricky C. Johnson Jr. (right) are proud to be working as safety consultants on the new San Francisco-Oakland Bay Bridge East Span construction project. Miners like Steve Obst work long hours on the Caldecott Fourth Bore highway tunneling project along State Route 24 in the Bay Area. 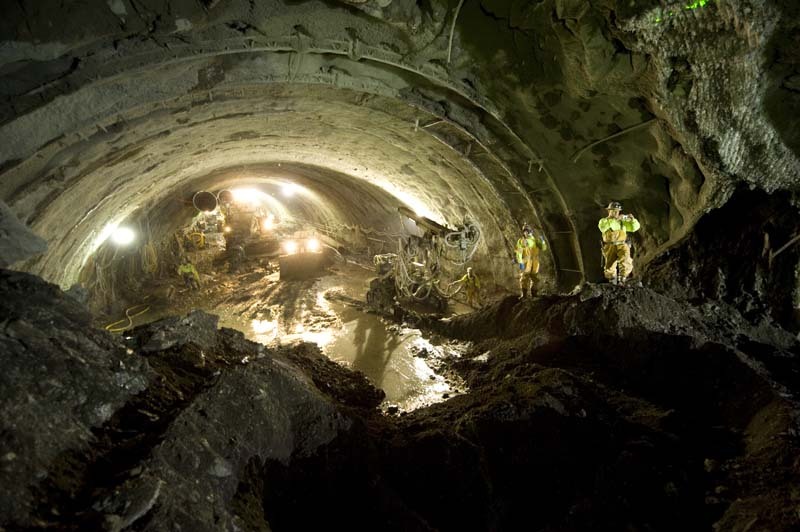 Tunneling moved at a rate of one to three meters a day until “breakthrough” occurred in November 2011. Surveyor Darryl Bond takes measurements and makes recommendations to engineers and contractors on a Bay Area Rapid Transit (BART) project to build a cable-car-based connector service between Oakland International Airport and the BART Coliseum station. Electrician Daniel Totty of St. Francis Electric pauses for a moment on the work site of the new Vallejo Station Intermodal transportation center, a planned waterfront transit hub that will serve the City of Vallejo and provide a gateway to the North Bay and Solano County. The San Francisco Bay Area’s Freeway Service Patrol is a fleet of tow trucks that provide free motorist assistance along the region’s busiest highways. (L-R) Richard Dean Anderson, Donald Pregent, Dennis Robertson, Diane Apodaca, Michael Price, Timothy Tomseth, Robert Bettencourt. Construction begins on the northeast section of the I-485 Outer Loop, bringing the interstate’s impact full circle to the outlying areas of northeast Charlotte. In the aftermath of Hurricane Irene, the North Carolina DOT’s ferry system offered at lifeline to residents of Hatteras Island. The region’s primary roadway, NC 12, was closed to traffic for 44 days following the storm. The ferry system transferred over 32,000 people and 18,000 vehicles during that time. Traffic flows freely within North Carolina’s capital city during rush hour. Downtown Raleigh is experiencing a resurgence as businesses are expanding and relocating to the center city area, due in part to the ease of access from nearby major highways. At the first sign of spring, North Carolina drivers are ready to feel the wind in their hair. Throughout the changing seasons, NCDOT maintains more than 80,000 miles of roadways that help North Carolinians discover new places. After years of gridlock on one of the busiest sections of I-40, Raleigh-area drivers are traveling with ease following the improvements made between Harrison Avenue and US 1. Jason Peterson, project manager for the Triangle Expressway, stands in front of an all-electronic toll zone found along the newest section of North Carolina’s first modern toll road. The $1 billion project is the single largest transportation infrastructure project in the state’s history. The cheerful face of a sunflower greets morning commuters on I-40 in southeast Raleigh. North Carolina DOT workers maintain 1,500 acres of wildflowers every year. The program is the largest planted wildflower program in the nation. District 4 Transportation Supervisor Brian Glover inspects red corn poppies, ox-eyed daisies, and California poppies growing in a roadside wildflower bed along I-795 in his eastern North Carolina district. North Carolina DOT workers maintain 1,500 acres of wildflowers every year. The program is the largest planted wildflower program in the nation. John C. Allen, chair of the Vehicle Probe Project Suite User Group, displays a Congestion Scan, one of the many data visualization tools developed by the University of Maryland’s CATT Lab, which are used to facilitate improved transportation planning and operations (the Suite Dashboard is pictured in the background). Cyclists Bob Bevill and Kim Hughs wait their turn at a rural Indiana intersection, behind a van driven by Natalie Smigel. Participants in the HIS Home 300 were raising funds for a Haitian orphanage while pedaling 300 mils through Illinois, Indiana, and Ohio in June of 2012. This photo, to me, is a transit version of Robert Frost’s Poem, “Two Paths Diverged.” If you look closely, the rail is set out before the handle on the streetcar and it is divided with one going left and one to the right. The handle at the fore front of the picture is what the conductor uses to traverse the streetcar forwards and backwards at the end of each route. I purposefully snapped the picture with the intention on having the viewer see the handle. Not 24 hours after the devastating Washoe Drive fire ripped across US 395 just north of the Nevada state capital, Nevada DOT maintainers replace damaged guardrail and make the route between Carson City and Reno once again safe for all travelers. The longest cathedral arch bridge in the nation, Nevada DOT’s 1722 foot long Galena Creek Bridge linking Reno and Carson City, provides the backdrop for a gathering of NDOT construction professionals. Dusk sets the stage for an overnight move of 1000 tons of concrete bridge using hydraulic jacks, steel beams and common dish soap as part of Nevada DOT’s West Mesquite Interchange Design-Build Project. Improving travel and safety, not to mention an aging concrete road bed, for nearly 100,000 motorists daily is all in a night’s work for Charleen Shoemaker and all part of the Nevada DOT’s i-80 Design-Build Project to rebuild Interstate 80 alongside downtown Reno. Sparks fly as Nevada DOT Maintainers Tony Gutierrez, John Picett, and Jeromie Sorhovet work to repair guardrail, a vital road safety element so easily taken for granted by passing motorists and just one of nearly 100 types of road maintenance tasks performed every day by Nevada DOT maintenance professionals. Nevada construction experts keep a keen eye as preparation beings to move 1000 tons of concrete bridge using hydraulic jacks, steel beams, and common dish soap as part of Nevada DOT’s West Mesquite Interchange Design-Build Project. From two legs to four wheels: walkers, bicyclists and vehicles all rush to reach the world’s largest cathedral arch bridge, the Galena Creek Bridge, as part of the July 2012 fun run/walk/ride event that unofficially opened the Nevada DOT I-580 Freeway Extension between Reno and the Carson City capital. A steady hand and dedicated focus are needed as work to improve travel and safety on Interstate 80 alongside downtown Reno as part of the Nevada DOT’s I-80 Design-Build Project. Alternate modes of transportation, such a bicycling, don’t just fuel healthier, more environmentally-friendly commute and travel options. They also spark smiles and a chance to connect with like-minded bicycle enthusiasts at events such as the July 2012 opening of the Nevada DOT’s I-580 Freeway Extension. Alaska Marine Highway System Captain Christian Bragi scowls into the cold, sideways July rain while docking the MV Malaspina at the Auke Bay terminal outside Juneau, Alaska. On the Oregon Department of Transportation’s Interstate 5 Willamette River Bridge project, Colin Quinn, a pilebuck for Hamilton Construction, cuts a drilled shaft steel casing for bent seven. Afterward, crews cut the casing’s rebar and poured concrete for the bent footing. Adam Engler, an ironworker for Donald B. Murphy Drilling Co., installs rigging to erect a drilled shaft cage on the Oregon Department of Transportation’s Interstate 5 Willamette River Bridge project. Here Engler is rigging the lower quarter points with which the cage is constructed and picked up. Oregon Department of Transportation videographer John Kazmierski climbs to the top of Portland’s iconic Fremont Bridge through a portal on the lower arch member. From the top of the bridge, he has a bird’s-eye view for documenting the Interstate 405 paving work below. Rhode Island Governor Lincoln Chafee shows off his biking skills and enjoys the scenery while riding on the newly completed South County Bike Path in South Kingstown. Today there are more than 50 miles of bike paths in the State, providing many options for families and individuals. Bob Dion is a seasoned electrician who takes pride in the fact that the work he does will impact the community. This photo, taken at the Pawtucket River Bridge Replacement Project in Pawtucket, RI, reflects his positive commitment to the project and the State as a whole. Eastern Face of Transportation Construction Project to “Un-Cork” Interstate 45 Bottleneck in Houston, TX. Representing the onward and upward emphasis on building for the future, this ramp at US 281/Loop 1604 in San Antonio, Texas is currently the site of the worst congestion in the region. Upon completion, eight connector ramps will save significant travel time for thousands of travelers in the metropolitan area. Connecting to the future, this ramp, one of eight, at the Loop 1604/US 281 interchange construction project in San Antonio, Texas, exemplifies innovative financing, environmental streamlining, modern construction methods, motorist safety and congestion relief in one of the fastest growing regions in the country. Safety plays an important role in the implementation of transportation projects. Here, on the Loop 1604/US 281 interchange construction project, four workers are securely harnessed high above the traveling public as workers race to complete projects to serve the growing travel needs of San Antonio and the South Texas region. San Antonio and South Texas are some of the fastest growing areas in the country and this area reflects the progress and future of our nation as new interchange connectors at Loop 1604 and US 281, along woth five heavy cranes, are silhouetted against the suburban San Antonio afternoon sky. 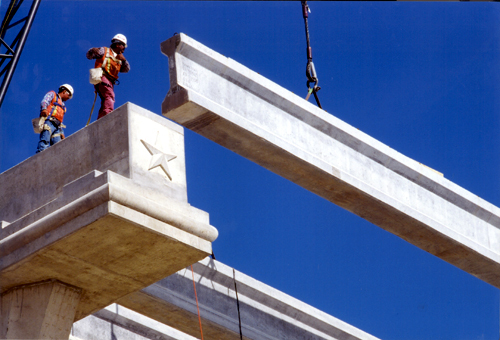 Construction workers building the final phase of the Wurzbach Parkway project in San Antonio, Texas. The Parkway will provide much needed East/West connections across the city. Congestion relief, shorter travel time and distances for many drivers will be welcomed by residents in early 2014. The steam and dust is bad enough in South Texas but here, two workers brave both . This picture was taken at the Wurzbach Parkway construction site in San Antonio, Texas during another hot, humid summer. This major corridor improvement will provide a much needed East/West connection through the city. Designing San Antonio! The region has embraced Context Sensitive Solutions in the design and aesthetics of many infrastructure projects. US 281 and IH 410 is one of many examples. Texture, color, and symbols vary to highlight cultural and historical themes and beautify the transportation system for residents and visitors alike. As far as the eye can see: the backbone of San Antonio, Texas’ transportation system is a circumferential and radial expressway network. Three circumferential and eight radial expressways, supported by a radial and grid arterial street network, best facilitate the travel opportunities of both residents and interstate freight. The historic Hays Street Bridge was restored using Transportation Enhancement funds and local contributions. The bridge, built in the 1880s, was closed in 1982. The bridge reopened in 2010, solely as a safe bicycle and pedestrian connection between downtown and the historic East Side neighborhoods of San Antonio, Texas. In addition to its circumferential and radial expressway network, San Antonio, Texas takes its transportation system “off the road” and into the San Antonio River and on its banks, providing 17 miles of continuous travelways for bicyclists, pedestrians and water enthusiasts, who enjoy exploring the cultural and historical downtown attractions. Remember the Alamo! San Antonio’s the top tourist destination in Texas, hosting 26 million visitors annually who use various modes of transportation, including the popular trolley system, to explore the cultural and historical downtown attractions. Located near the famous Riverwalk, the Alamo is the most visited attraction in the City. Eric Fielder, Coby Klein, and Matt Saunders from Danny’s Construction Co. Inc. of Shakopee, MN are shown preparing the Pier 6 rocker on the Mobridge Truss Bridge on US Highway 12 for jacking so repairs can be made. The slump test is the industry-wide standard method to measure the consistency and workability of portland cement concrete. Here Journey Transportation Tech Craig Orke of the South Dakota DOT measures the height difference between the cone mold and a cone of fresh concrete on an Interstate 29 reconstruction project. Intermodal Transit facility Archways being built. Three of the St. Lucie County Florida’s fixed route buses waiting for passengers to board at the Intermodal Transit Facility. Each bus stops in front of the column that designates where it is to travel making it easier for passengers to know which bus to board. The Treasure Coast Connector is the slogan for St. Lucie County Florida’s fixed Route services. The sun is the logo. Here you see the bus with the sun on the center and the name displayed across the center of the bus as it is entering the Intermodal Transit Facility. The newly constructed, Intermodal Transit Facility in Fort Pierce, Florida has an LEED equivalency of gold. On the west side of the building, several of the Florida Highway Men are honored for their talents. A signature Poinciana tree is displayed that is typical of their artwork. The mural is a tribute to local artist, now world renowned. This building is iconic, it represents the value of historic preservation in the community while also contributing to a sustainable infrastucture for present and future residents. Assistant Resident Engineer Mike Neyman inspects the Huey P. Long Bridge 200 feet above the Mississippi River in New Orleans. Started shortly after Hurricane Katrina, the $1.2 billion widening of the bridge has served as a symbol of hope and resilience for the great city. Workers from PSI Crane and Rigging help set a 206 foot pedestrian bridge over interstate 70 in Glenwood Springs, Colorado. Two cranes were used to lift the bridge into place while the interstate was closed to traffic. An early April snow shower added to the drama of the scene. The role of the parent during the supervised driving process is critical for preparing teen drives for the power of the nation’s transportation network and offers parents a chance to share with their teen driver new places not yet explored from the driver’s seat. At the April 2012 press event, New Jersey DOT Safety Service Patrol Operators stand together in support of a new public-private partnership that will provide additional funding to transportation programs like theirs that improve safety for motorists across the state. Motorists from all over the nation and world travel to the four day Bonnaroo concert in Manchester, Tennessee and prepare to exit to take their place in the acres of fields designated for the attendees. Against the horizon of the mountains of East Tennessee, the operator of a dozer moves rock to the edge of a 180 foot drop where a landslide closed Interstate 75 in rural Campbell County, Tennessee in March 2012. A bridge inspector stands on top of the Market Street Bridge in Chattanooga, one of Tennessee’s 20,000 bridges inspected every two years, waiting for the bridge to fully open so his inspection can begin. Tennessee DOT employee Bud Slaton provides techical expertise on preparations for winter snow and ice to the Knoxville news media in front of TDOT salt bins as winter road maintenance helps keep Tennesseans moving. The skyline of Nashville provides a backdrop for crews working at night utilizing an innovative method to rehabilitate an interstate bridge. The Accelerated Bridge Construction (ABC) process results in minimal inconvenience to motorists in urban Nashville and maintains the interstate highway network. A Utah DOT Area Supervisor prepares equipment for the upcoming avalanche season in Utah. Mountain View Corridor Project Director Teri Newell looks on as crews work on the new 15-mile roadway. Newell has overseen this $1.035 billion project from the beginning. Commissioner Greg Whirley is the face of the Virginia DOT, which is replacing the aging Huguenot Memorial Bridge over the James River in Richmond. Approximately 25,000 vehicles use the bridge daily. The first palce of the $51 million new bridge opened June 30, 2012. Virginia DOT is replacing 11 bridges on Interstate 95 in Richmond. The four-year project covers seven miles of I-95, where traffic will be reduced to one lane in each direction, Sunday through Thursday nights. By doing the work at night, VDOT aims to complete the project by minimizing driver impacts. Connecting the East Coast across the Potomac River, the recently completed Woodrow Wilson Bridge keeps people and freight in more than 200,000 vehicles daily moving on Interstate 95. Virginia was a major partner in constructing the twin six-lane bridges, which include double-leaf bascule spans over the main navication channel. Washington State DOT crews secure a concrete girder to a crane. Thanks to some of the largest mobile cranes on the west coast and skilled workers, each girder at 92nd Avenue Northeast and SR 520 can be set in about an hour. Workers Glen Franklin, Todd Lamberton, Ryan Lange and Dwayne Sweat strain under the weight of a concrete culvert section being placed to improve fish migration as part of the Washington State Department of Transportation’s SR 520 – Medina to SR 202: Eastside Transit and HOV Project. Lewis Peters drives a special trailer used to transport concrete girders to a bridge construction site for the Washington State Department of Transportation’s SR 520 – Medina to SR 202: Eastside Transit and HOV Project. Jeff Dreon stabilizes a crane’s cable after detaching it from a concrete girder placed at an overpass near Bellevue, Washington. The Washington State Department of Transportation’s SR 520 – Medina to SR 202: Eastside Transit and HOV Project is expected to open to traffic in 2013. Utility installation at the Evergreen Point Road lid. Washington State DOT crews cast early morning shadows on the underside of the Evergreen Point Road lid over SR 520 as they install a new water main. It’s a good thing project inspectors Brad Fisher and Nathan Retherford aren’t scared of heights! For these two Washington State DOT engineers, walking 300 fee above the Columbia River on the top of the SR 433, Lewis and Clark Bridge is a regular day on the job. Tapani Underground Inc.’s David Schmeusser excavates bridge foundations for a Washington State DOT interchange project in Vancouver. Joe Reynolds, West Virginia Division of Highways worker, gets an up close and personal look inside of a sink hole in order to document damage along US 60 in Barboursville, West Virginia. We know, we know. We promised you that People’s Choice voting on submissions would start on Monday, August 13. What can we say? We received so many entries that it is taking us a bit longer to get them ready for posting and voting that we anticipated! We hope to have everything ready to go by next Monday, August 20. Stay tuned, and thanks for your patience. Sometimes, things take a bit longer to come together than expected.